You are here: Home » How Does Your Garden Grow? Today Jamie Ridler has invited us to join with her and others and throw open our garden gates and give a little tour. I hope you’re inspired to do a bit of a garden walk and visit other blogs as well. I certainly have things I want to show you in my garden, but I don’t think we’ll do a straightforward tour. I’m going to show you a little of this, and talk a little about that, and show you the gardens in my studio and the flowers guiding my week. While some plants are indeed blooming, our weather this Spring seems to have affected everything, apparently delaying some of the alchemical garden magic by several weeks. But even so there are some wonderful things to show you. 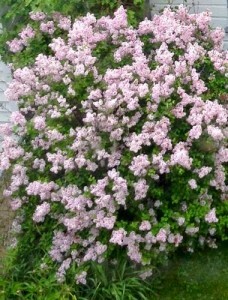 I love heavily-scented old-fashioned flowers, and oh how I adore lilacs. I have a smaller one in my front yard, and a much larger on in the back. Folklore suggested that to test if one’s love returned your affection you could eat five lilac petals in succession and if this could be done without a petal getting stuck in your throat your lover was true. While I have no need to test that theory, I do like the taste of lilacs – as in lilac sugar. It’s easy enough to make if you’re sure your lilacs are safe – simply fill a jar with alternating layers of sugar and clean dry lilac petals. Leave the jar in the cool dark for a few days, shaking occasionally and your sugar will be infused with lilac goodness. 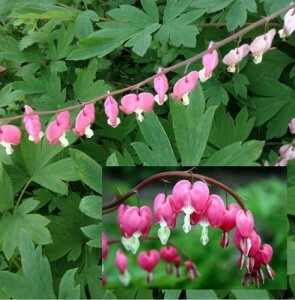 I have two Dicentra, Bleeding Hearts which have grown spectacularly wide this year. I think they really liked our particularly harsh winter. 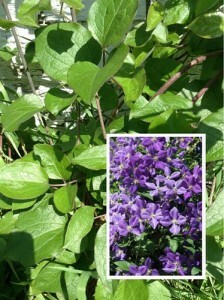 I planted these in honor of my grandmother who loved them dearly, and I so understand why. What’s not to love about branches filled with hearts? Another charming name for these lovely little hearts is Venus’s car. My lilies-of-the-valley aren’t blooming in profusion this year and that makes me a bit sad. I’ll make sure to plant more next autumn, and perhaps even some of the pink variety. Because frankly it’s just not Spring without an abundance of these fragrant beauties. 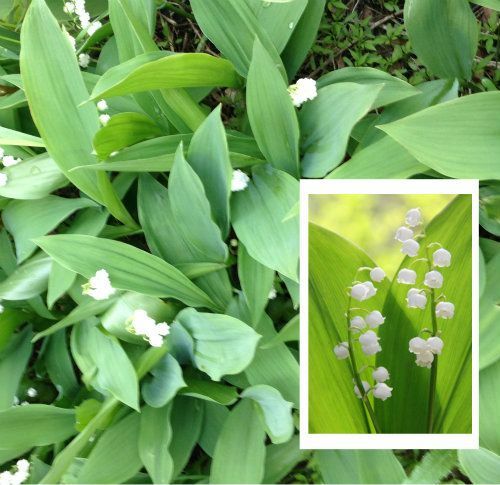 The proper name is Convallaria magalis, and magalis means that which belongs to May. I would love this flower anyway, but its association with Mercury/Hermes just makes me all the fonder. 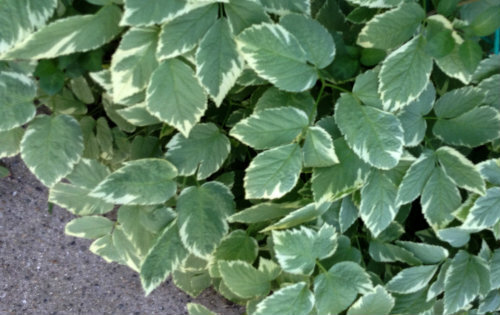 My variegated mint is doing fine. It’s totally no-maintenance and I have it growing in a narrow patch leading to back gate. The way back there itself is narrow and so you can’t help but brush against the mint sometimes as you’re walking, and that’s such a delightful refreshing scent. Lore says that Pluto pursued the beautiful nymph Minthe and when his wife Proserpine found out, she turned Minthe into a plant. But clearly a very fragrant one. Lore also suggests that mint will not grow where the husband is henpecked, and that always makes me laugh. My Jackmanii clematis is behind schedule. The last couple of years the blooms have been so profuse I wasn’t sure the trellis could bear the weight. The inset photo is what it looked like last year. 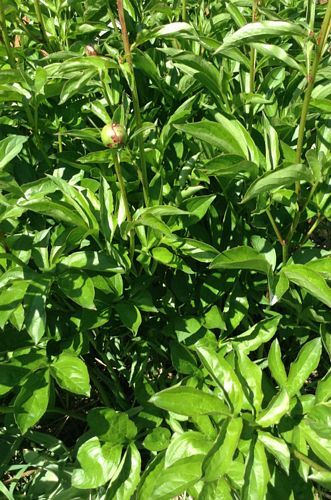 Finally, the last treasure to show you is my peony bush. It’s just starting to bud so there’s not a whole lot to see yet, but I’m eagerly anticipating harvesting armfuls of luscious frilly fabulously-scented blossoms. The Chinese name for peony is ‘sho yu’ which means most beautiful and I couldn’t agree more. We may be finished touring the outside garden, but my love of flowers certainly doesn’t end there. Obviously training as a flower essence practitioner and then as aromatherapist and using it those skills with my clients in my intuitive work is yet another way for me to stay connected to the flower spirits. But I also love finding ways to play with flowers in my studio as well, so let me show you a few flowery projects I’ve been working on. 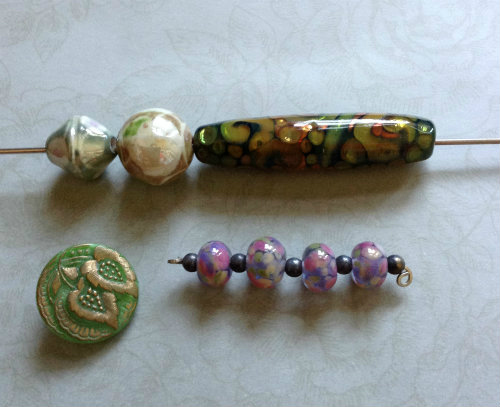 I’ve collected a lot of lovely flower beads (and buttons) and I’m constantly stringing and restring them as the fancy strikes. I tend of think of my jewelry like creating a bouquet – a little of this, a little of that. Right now these are some of the beads on my work table that I’m sitting with and seeing what I might create. A garden-y beaded amulet bag. A felt bag (the handles are tucked inside). I’m inordinately proud of this as the bag is my very first knitting project and it felted up beautifully. 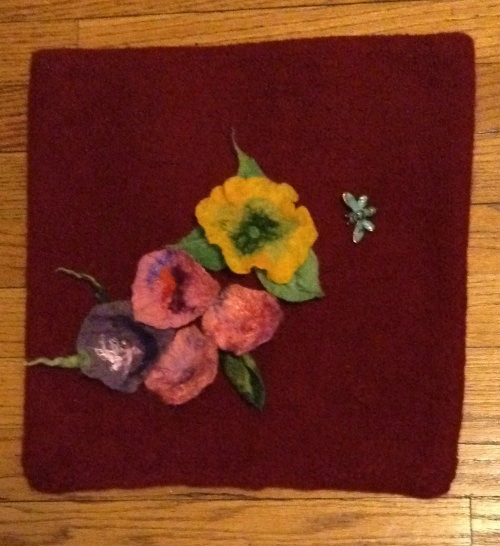 The flowers are needle felted, and I think I’ll be added more and switching them out occasionally as I’m inspired. I love the little vintage bee pin I found. It feels a bit like a little inside joke – Deborah means Bee, and so here I am in a garden of my own making. 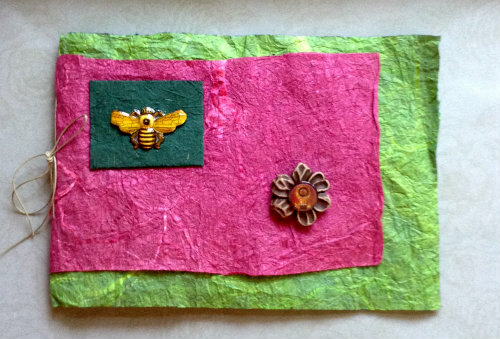 And finally a tiny handmade journal with another vintage bee pin – this time a metal badge-like pin – and a wooden flower button to which I added a sparkly cabochon center. The paper is handmade and very very soft like a flower petal, and whenever I touch it I think about the fabulous paper-making classes I’ve played in. It’s been a while since I’ve made paper, but I’m feeling the urge again. The next round I’ll certainly be sure to include some flowers. To wrap things up I have one more garden-y thing to share. Every Sunday I do some sort of card reading – perhaps a quick one-card draw or something more lengthy and in-depth. Today I chose two cards. 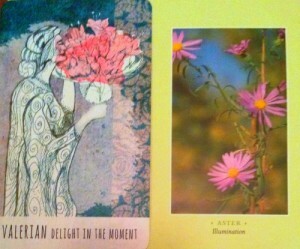 One from the Plant Ally Cards deck by Lisa McLoughlin which I absolutely love, and the other Voices of Flowers by Rhonda PallasDowney. I look forward to seeing how “delight in the moment” and “illumination” show up this week. And there you have it – a peek into all of my gardens. What about you? What’s growing for you? Do tell – you know I love to hear. How lovely and robust your plants look. Gardens always inspire me to be creative too. Thanks for visiting Angella. And I agree, I think the creative energy that is so apparent in gardens is most definitely a creativity kickstarter. Thank you so much for sharing your garden both inside and out. I truly enjoyed being part of your creative world. Thanks Ginny – I’m glad you stopped by. How fun we get to glimpse into each other’s spaces and enjoy it all. It’s really quite tiny but filled with love. Very pretty! I had never seen bleeding hearts (except in an earlier post of yours). They are wonderful. My dad was a florist and we had lots of trees and plants around our house when I was growing up. Although I love looking at flowers, I am not one for growing them. I don’t like getting my hands dirty (with dirt – I don’t mind getting them dirty with paint and glue!) so we don’t have much of a garden now. Thanks for sharing your pretties! I love the idea about the lilacs. Now off to go ‘borrow’ some from the neighbors. LOL – good luck with the borrowing and enjoy the sugar. And thanks for stopping by and saying hello Judy – I appreciate it. Lily of the Valley fragrance is my favorite. I miss the midwestern garden. (I live in Florida.) Twice, by two different friends, I received a bouquet of spring flowers from friends–in a box. It was heavenly. And I have a framed photograph of bleeding hearts nearby to remember. I love seeing flowers in your garden, Deborah. Oh what great friends to send Spring bouquets to you! And I’ll have to admit it, Midwestern gardens have the power to keep me here – LOL. Beautiful! 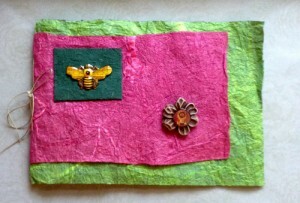 LOVE that bee pin/homemade journal! Gorgeous! Wishing you the best of the best! Thank you! And best wishes to you as well Adrea. Ohh I love thos little white bell flowers. I don’t know how they are called in English, but when I was a child I used to pick them in a forest every May. They still have my favourite frangrance ever! Lilies-of-the-valley like shade so forests are a wonderful place for them to grow. And I agree, they’re one of my favorite scents as well. I love this post! Thanks for sharing your garden beauties! Lilac and Lilly of the valley are favorites of mine! It’s all about flowers now and your collection was wonderful. The cards too. Being present and illuminated. Yes. Indeed it’s all about the flowers now. 🙂 We had a long winter to get through to enjoy this haven’t we? Wishing you lots of floral joy. How wonderful!! I loved not only seeing all of you beauties (wow, your lilacs are amazing!!) but also reading the lore and your memories! The lily of the valley was one of my mom’s favourites. It’s a joy for me to see it in your garden! Thank you for being a part of the garden hop and for sharing not only your green space but also how it inspires you, your life and your work! What a delight to be able to visit each other’s gardens – thanks for instigating the fun Jamie. And thanks for stopping and saying hi. We have several of the same plants! Cool. I am also waiting excitedly for my peonies to bloom. I hope they don’t come out after I leave for my vacation! Or, if they do, that they stick around at least until I get back a week later. I have lilacs, giant allium, snowdrops, peony, pansies, lotsa hosta and rudbeckia. Probably others as well, but those are what matters to me! Oh what a lovely sounding garden Amy! And here’s to having peonies waiting to greet you when you return from vacation. Thanks Susan. How lovely that you have orchids (and euphorbia – that name always makes me smile!). While I’ve never grown or kept orchids, I use orchid flower essences extensively, and love looking at photographs of each as I’m using them. Such an amazing and diverse clan of beauties. It’s so much fun to see others’ gardens, especially those from other areas. I have mint in my garden, but none of the other beauties. 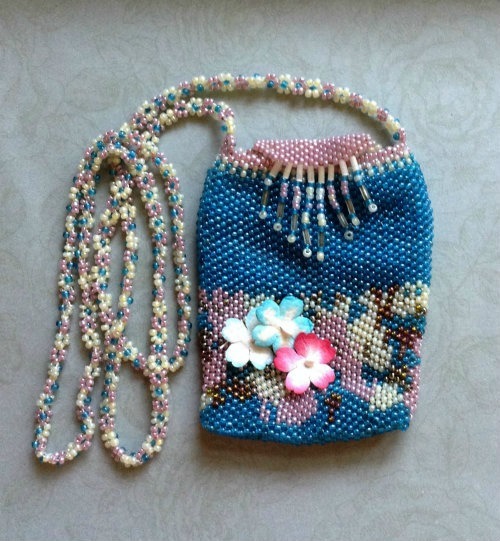 And, that beaded bag! Oh. Just, oh. Thank you for sharing your garden, indoors and out. Thanks for coming on the tour with me Linda. I really is fun peeking into each other’s spaces isn’t it?